Dear audiophiles, all cartridges in this section are for sale. We try to include here only rare and hard to find items. If you find something of your interest and want to purchase or ask for additional information, please contact via email or by phone. We also have FRESH ADDED section full of gear and cartridges too. Please visit as well. Most of the payments could be done via Paypal or other discussed methods. Please contact for instructions and link. Thank you for visiting and enjoy your shopping. Up for sale is mega rare JEWELTONE JT-R Ⅱ Ribbon Moving Coil Type Phono Cartridge. This model is manufactured by the famous Japanese Phono Stylus Company, NAGAOKA under the Brand Name “ JEWELTONE “. Unusual construction consists of Ribbon ( One Turn ) coil and powerful ALNICO magnet with TITANIUM cantilever. This design promises free from stress output caused by conventional magnetic coil (inductance) and TITANIUM cantilever is much better material nature for use in low-mechanical impedance. Result is uncanny presence and details with dynamic contrast in its sound. I am anxious that there is very few working example exists. This one is in perfect operational and cosmetic condition with 150 hours of play time. It was in my collection for years. Stylus Tip: Special Elliptical Diamond 0.4 × 0.8mil. Output Voltage: 0.04mV at 1kHZ/5cm/sec. to already super detailed sound, superior tracking and super low noise level. cantilever and Micro Ridge stylus has 15 hours of play test. I have Transfiguration Temper W cartridge for sale. The cartridge is in very good cosmetic and operational condition. The cartridge was top of the Transfiguration line just a few years ago. It possesses all best qualities of Transfiguration sound doubled. The cartridge is on the top of the MC food chain. Vinyl Engine get it 5 stars and I would love to give the same mark. The cartridge has only 250 hours. I'm the second owner. Sell it at 70% off. Miyabi Mark Levinson MLC-1 phono cartridge for sale. The cartridge is in perfect operational and cosmetic condition. The stylus has 20 hours of play time and is in MINT condition. It comes with the boxes and stylus guard. best sounding Miyabi creations-Red Rose / Rose Petal phono cartridge for sale. purchased the entire Miyabi collection 13 cartridges recently. I have very rare Van Den Hul MC-1000 phono cartridge for sale. The cartridge is in perfect operational and cosmetic condition. The cartridge was top of the line when Van Den Hul were making some of his creations for Benz Micro and Empire USA. The cartridge comes with wooden box and mounting bolts. I have very rare Blue Oasis cartridge for sale. The cartridge was sold in early 2000s at remarcable $3500. The cartridge has boron cantilever. micro ridge stylus with 150 hours of playtime only. The cartridge comes with wood shipping box and mounting ware. Haniwa HCTR 01 phono cartridge and HEQA 02 phono amplifier for sale. This is the most exciting combo money can buy these days. All mint and in perfect operational and cosmetic condition. Haniwa has ultra low inductance of 0.4 Ohms and ultra low impedance of 0.3µH. It tracks perfect at 0.8-1.3 gram. To translate all this in English- it is pure sound without distortion from extra layers of metal- straight to your ears practically no wearing stylus at all. 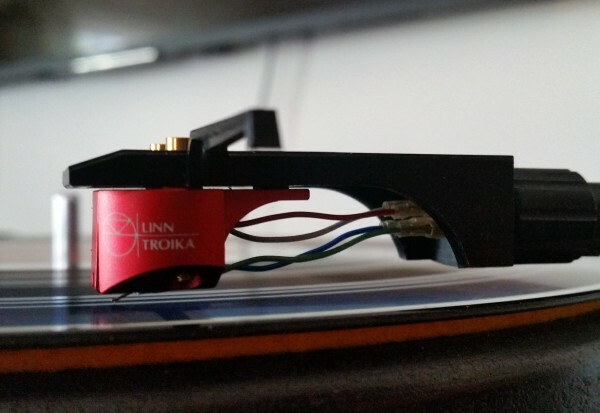 The cartridge comes with original phono designed to handle 0.4 Ohms internal inductance to amplify well to line stage level. If you use any other cartridge with it- it's just dead silent MC phono stage. Love it! The combo runs for $12000. Miyabi /47 phono cartridge for sale. This is low output moving coil type. The cartridge has 150 hours of play time. It comes with the box and mounting ware. The shell pictured is not part of this listing. This is Benz MICRO cartridge designed and produced for Heed Audio to their specifications. The Zene cartridge has improved pole piece featuring a machined insert for the O-ring damper, resulting in greater mechanical linearity in its suspension. The cartridge is remarkable performer, reading every single bit of the record- eating it and breathing it. The cartridge has 20 hours of play time , It is clean and shiny. The shipping box and mounting bolts included. Supex SDX-2000 phono cartridge for sale. The cartridge was in my collection for years. recently bought brand new copy- this one for sale. Hours before purchase was 150. I put another 50 playing it for 3 weeks total. The cartridge has boron cantilever. It comeas with all boxes and papers. Sensitive Sound Splash phono cartridge for sale. The cartridge is newest production from Russia. The cartridge is MC type with 0.5 mV output. The stylus is Micro Ridge on solid boron cantilever. The sound is very close to Van Den Hul Grasshopper or Colibri. Very good dynamics, open air tops and smooth liquid mids. The cartridge comes withall boxes and mounting ware. The cartridge has 50 hours- mostly testing records. Ortofon SPU GTE phono cartridge for sale. This cartridge outperformes hundreds of other Ortofons. In fact most people put it in the same league with Rohmann and Anna. Without the lyric and emotions- great soundstage, amazing dynamics and base. What else- good tracker and plays on all arms equally well. The cartridge has about 15 hours after Namiki Japan retipping. Clean and solid suspension. It comes with box and stylus guard. Acoustical System Archon cartridge for sale. The cartridge has aluminum chunk body, titanium cantilever and . The cartridge is 0.5 mV low-medium output. The cartridge is in perfect operational and cosmetic condition. It has less than 100 hours of play time. Please note the headshell is not part of this sale. Miyabi MCA rare phono cartridge for sale. This is low output moving coil type. The cartridge is in perfect operational and cosmetic condition. It comes with all boxes and mounting ware. ​Please note. The headshell is not part of this sale. Sony XL-88 cartridge . This was and is top of the cartridge produced by SONY. The cartridge was sold in Germany for 3500DM and was as expensive as Volkswagen in it’s days. The cartridge is in good operational and cosmetic condition. The cantilever is straight and stylus is sharp. The stylus is so tiny, even my microscope does not pick it up quite well. The cartridge comes with the plastic shipping box. everybody's most wanted list. The base signature of early Kiseki production is still un-surpassed and is one of the bench marks for High End MC cartridges. The cartridge comes with the stylus guard, wooden box and mounting bolts. It has 20 hours of play time. The cantilever is boron with Micro Ridge stylus . Supex SD-901E+ SUPER cartridge for sale. This is 3.5mV high output moving coil. Supex line is famous for it’s great tracking and neutral sound reproduction. The cartridge is in very good cosmetic and operational condition. The cantilever is straight. The stylus is perfect.. Very clean and neat. The cartridge has only 250 hours. The cartridge comes with the original boxes. Famous Mr. Brier phono cartridge for sale. This is low output moving coil type. The cartridge is in very good operational condition. It has brand new boron cantilever and Micro Ridge stylus made by Namiki Japan. The cartridge was used for 15 hours with new cantilever. The original Brier cartridges were on top of the food chain already. The new Micro Ridge stylus make it sound like the biggest player. It puts to rest most of $5K-$10K cartridges. The set is complete with all boxes papers, good and headshell made by Fidelity Research. Ortofon MC-2000 MK II phono cartridge for sale. The cartridge has boron cantilever and line contact stylus. It was re-tipped by Namiki Japan and has 30 hours after re-tip. The suspension is strong- no issues. The sound is as good as it gets. It is in the league with Anna, A-92 and Rohmann. Supex SD-801 cartridge for sale. This is MC type with 0.2mV low output. The cartridge is in perfect condition with straight cantilever, sharp stylus. The cartridge was played for 300 hours and is in perfect operational and cosmetic condition. Technics EPC-100C cartridge for sale. This is integrated shell top MM cartridge from Technics. The Legendary package not sold in USA in this completion. The cartridge is new with just over 20 hours. Have fun playing or pure collector's item. Audiocraft AC-05M rare phono cartridge for sale. This is low output moving coil. The cartridge is in perfect operational and cosmetic condition. It has 300 hours of play time. The Audiocraft later became My Sonic Lab and Haniwa- two of the best modern premier cartridge brands. Sumiko Palo Santos Presentation for sale. This is top MC cartridge from Sumiko line. The cartridge is MINT with 40 hours of play time. Comes with the Lucite box and mounting ware. Mark Levinson cartridge by Madrigal labs for sale. It is one of the best balanced and neutral cartridges out there. You can listen to any kind of music and have equal enjoyment. No fatigue at all.. This is rare quality among MC cartridges. The cartridge has 250 hours and in very good cosmetic and operational condition. Sumo MK II phono cartridge for sale. The cartridge is in perfect operational and cosmetic condition. It has 100 hours of play time only. The cartridge performs as it should with great tracking, dynamic base and liquid mids. The cartridge comes with the original box, stylus cover, mounting ware and other goods. Highphonic MC R-5 for sale. The cartridge has ruby cantilever with line contact stylus It is all original. The cartridge has 50 hours of play time. The Highphonic cartridges are elite line of Denon. They were made spcifically for High End reproduction vs. radio station use of regular Denons. The vinyl Engine gives 5 stars to this rare gem. Sumiko SHO cartridge for sale. This is 2.5mV high output MC type. The cartridge has 200 hours and in very good cosmetic and operational condition. It is clean, no marks, cantilever is straight, stylus is perfect. The cartridge has great tracking, very open mids and defined base. No need for MC transformer- you get pure and clean sound. This is one of the Sumiko’s Elite line with MSRP of $1500. The Lyra Kleos is one of the best sounding harmonic and dynamic LOMC I've heard in a long time.